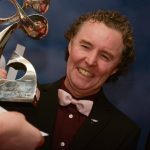 The Chairperson of Glór na nGael, Pat Carey and RTÉ Raidió na Gaeltachta presented Áine Ní Churráin have presented the annual Glór na nGael awards the Glassan Hotel, County Westmeath on Saturday 9 February 2019. Áislann Rann na Feirste has won the top prize: the Glór na nGael Trophy sponsored by Foras na Gaeilge and a €20,000 cheque sponsored by the Department of Culture, Heritage and the Gaeltacht. A total prize fund of €80,000 was awarded to community groups and 3ú level college societies in acknowledgement for their endeavours to promote the Irish language. Speaking at the event, Pat Carey said that Glór na nGael and voluntary groups are working in a new era of language promotion in the community. “More than ever the State, particularly in the South, is acting in unison with the community,” Carey said. Other key awards were presented to the Carn Tóchair Development Committee, Co. Derry, Glór na Móna, Belfast agus Cairde Teo. In Armagh. A special award, Gradam Ghlór na nGael, was presented to brothers Séamus and Seán Mac Seáin. The two were born in Belfast and each, in their own ways, have made significant contributions to the Irish language in Belfast and further afield. Áislann Rann na Feirste won the main prize. A non-profit community based company, it works to promote community development primarily through culture and language. It delivers its work through subcommittees such as the environment and the language. It has achieved many of its goals during 2018. The group is also pioneering in its work supporting families. Describing the work of the Áislann, Lorcán Mac Gabhann, Glór na nGael’s Chief-Executive, praised its contribution to the community, both young and old, in Rann na Feirste and Donegal. “I must also mention the Home Work Club and Youth Club which are renown throughout the country and which operate a strong and effective language policy,” he said. Áislann na Feirste is in use every day and night of the week. The committee makes effective use various schemes including Glór na nGael’s Teanga Tí scheme. “The Áislann is an example of good practice for community groups throughout Ireland,” Mac Gabhann said.